This time Patter has chosen to share a song I am very familiar with - Mary Did You Know. Please visit Patter's blog HERE to read her teaching based on this song. Whenever I hear this song it reminds me of years ago when I would each year take part in a Christmas display in our town organised by the combined Churches of our town. It was "Christmas the Full Story". Starting with the Birth and finishing with Christ's resurrection. I helped paint scenery and props and acted in different roles over the different years. One year I was Mary ( Jesus mother) at the cross and this song played in the background. It really touched my heart as I could realise how Mary must have felt watching her son die on the cross and not fully understanding why until after He rose to life. 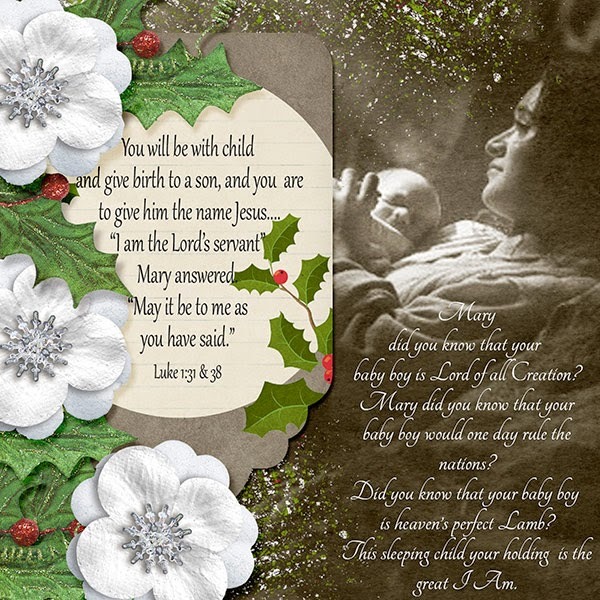 For my digital art I chose to use the scripture where Mary accepts what the Angel told her was to take place. She accepted but possibly did not really comprehend what role she was playing in God's plan for His redemption.